makes it more than an aircraft. The SKELDAR V-200 is maritime ready. and unmatched in its class. The SKELDAR V-200 Unmanned Aerial Vehicle (UAV) provides unmatched technology for land and sea operations. The SKELDAR V-200 is maritime ready. On watch, all the time, real time and unmatched in its class. The fact that it is not just an open interface to Battlefield Management System (BMS) and C4ISR systems, but also 4586 STANAG compliant, makes it easier to implement on any maritime vessel. With a double payload capability and uniquely incorporating Heavy Fuel, the SKELDAR V-200 is the perfect Unmanned Aerial Vehicle (UAV) for maritime and naval operations. Flexible and highly versatile, the Remotely Piloted Aircraft System (RPAS) is truly multi-role, and ideal for a wide range of applications such as Reconnaissance, Identification, Target Acquisition and Electronic Warfare. A number of Commercial Off-The-Shelf (COTS) High resolution Electro Optical/Infrared (EO/IR), Synthetic Aperture Radar (SAR) and Electronic Warfare (EW) sensors are available. all the time, real time and unmatched in its class. and ideal for a wide range of applications such as Reconnaissance, Identification, Target Acquisition and Electronic Warfare. A number of Commercial Off-The-Shelf (COTS) High resolution Electro Optical/Infrared (EO/IR), Synthetic Aperture Radar (SAR) and Electronic Warfare (EW) sensors are available. Designed for civilian and military missions, this unmatched Vertical Take-Off & Landing (VTOL) System benefits from a common control concept and user interface in the context of command, control and payload management. Equipped with multiple capabilities including surveillance and 3-D mapping, UMS SKELDAR’s drones provide an edge in any environment – day or night. Designed for civilian and military missions, this unmatched Vertical Take-Off & Landing (VTOL) and benefits, system or platform from a common control concept and user interface in the context of command, control and payload management. Equipped with multiple capabilities including surveillance and 3-D mapping, UMS SKELDAR’s drones provide an edge in any environment – day or night.. Designed as a highly effective Vertical Take-Off & Landing (VTOL) aircraft, this system is provided ready for seaborne missions. Multiple payload options, robust engineering add up to an unmatched maritime Unmanned Aerial Vehicle (UAV) suitable for C4ISR and SAR roles..
At sea there is no room for error, and the SKELDAR V-200 heavy fuel engine, makes it the Unmanned Aerial Vehicle (UAV) of choice for navy commanders or any maritime installations. This advanced engine provides additional landing and take-off assurance in environments where conventional fuels are prohibited. The SKELDAR V-200 uses Jet A-1, JP5 and JP8, a kerosene-based fuel (NATO code F-34). This flexible rotary Vertical Take-Off & Landing (VTOL) is suited to a range of military and civilian applications from oil exploration platforms and Search and Rescue (SAR) operations to C4ISR missions from battlefield situations, border surveillance and security patrols. Equally at home, at land or sea, the V-200 is recognised as a best-in-class Vertical Take-Off & Landing (VTOL) in its endurance segment. Designed as a highly effective Vertical Take-Off & Landing (VTOL), this system is provided ready for seaborne missions. Multiple payload options, robust engineering add up to an unmatched maritime UAV suitable for C4ISR and SAR roles. At sea there is no room for error, and the V-200 heavy fuel engine, makes it the Unmanned Aerial Vehicle (UAV) of choice for navy commanders or any maritime installations. This advanced engine provides additional landing and take-off assurance in environments where conventional fuels are prohibited. The V-200 uses JP-8, a kerosene-based fuel (NATO code F-34). This flexible rotary Vertical Take-Off & Landing (VTOL), is suited to a range of military and civilian applications from oil exploration platforms and SAR operations to C4ISR missions from battlefield situations, border surveillance and security patrols. Equally at home at land or sea, the V-200 is recognised as best-in-class VTOL in its endurance segment. NATO Standardisation Agreement 4586 pre-qualifies the SKELDAR V-200 Vertical Take-Off & Landing (VTOL) platform for military procurement and integration with other systems: interface of the Unmanned Control System (UCS) within the Unmanned Aerial Vehicle (UAV) comprises interoperability, data link, command and control, and human/computer. From hard to reach terrain to ship borne operations the SKELDAR V-200 provides optimum efficiency and safety across military and civilian missions, including endurance hover functionality. Requiring no runway, this sophisticated Unmanned Aerial Vehicle (UAV) provides extremely fast take-off and landing, and its agile and readily deployable flight performance compares to other compact fixed wing UAV systems. NATO Standardisation Agreement 4586 pre-qualifies the V-200 for military procurement and integration with other systems: interface of the Unmanned Control System (UCS) Unmanned Aerial Vehicle (UAV) comprising interoperability, data link, command and control, and human/computer. Developed with a low lifecycle cost in mind, the modular design enables system customisation and functional development, with air maintenance carried out at unit level. Compartments can be easily accessed for service, maintenance and payload reconfiguration. From hard to reach terrain to ship borne operations the V-200 provides optimum efficiency and safety across military and civilian missions, including endurance hover functionality. Requiring no runway, this sophisticated Unmanned Aerial Vehicle (UAV) provides extremely fast take-off and landing, and its agile and readily deployable flight performance compares to other compact fixed wing UAV systems. Designed as a highly effective Vertical Take-Off & Landing (VTOL) aircraft, this system is provided ready for seaborne missions. Multiple payload options, robust engineering add up to an unmatched maritime Unmanned Aerial Vehicle (UAV) suitable for C4ISR and SAR roles. 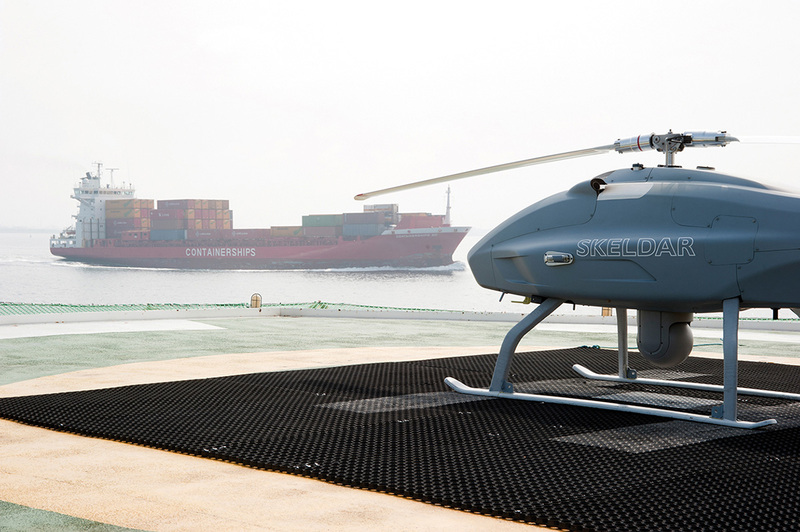 At sea there is no room for error, and the SKELDAR V-200 heavy fuel engine, makes it the Unmanned Aerial Vehicle (UAV) of choice for navy commanders or any maritime installations. This advanced engine provides additional landing and take-off assurance in environments where conventional fuels are prohibited. The SKELDAR V-200 use JET-A1, JP5 and JP8, a kerosene-based fuel (NATO code F-34). This flexible rotary Vertical Take-Off & Landing (VTOL) is suited to a range of military and civilian applications from oil exploration platforms and Search and Rescue (SAR) operations to C4ISR missions from battlefield situations, border surveillance and security patrols. Equally at home, at land or sea, the SKELDAR V-200 is recognised as a best-in-class Vertical Take-Off & Landing (VTOL) in its endurance segment. The SKELDAR V-200 is a versatile Vertical Take-Off & Landing (VTOL) solution for a wide range of applications such as Reconnaissance, Identification, Target Acquisition and Electronic Warfare. A number of Commercial Off-The-Shelf (COTS) high resolution Electro Optical/Infrared (EO/IR), Synthetic Aperture Radar (SAR) and Electronic Warfare (EW) sensors are available. ViDAR - Visual Detection and Ranging is an airborne persistent wide area maritime search system that autonomously detects objects on the ocean surface and provides the operator with a detailed image of objects that other search methods often miss. ViDAR provides over 80 times the area coverage compared with existing EO/IR systems. It provides wide-area situational awareness and intelligence gathering by means of collection, identification, categorisation and geo-location of complex emitters. Hyperspectral imaging may be used to collect and process information from across the electromagnetic spectrum. Hyperspectral sensors are ideal to map large geographic areas quickly and accurately, showing mineral resources development on the surface of the earth. The maps may subsequently be used by Unmanned Aerial Vehicles (UAVs) to assess the relative abundance of minerals and their importance in the local geological context.